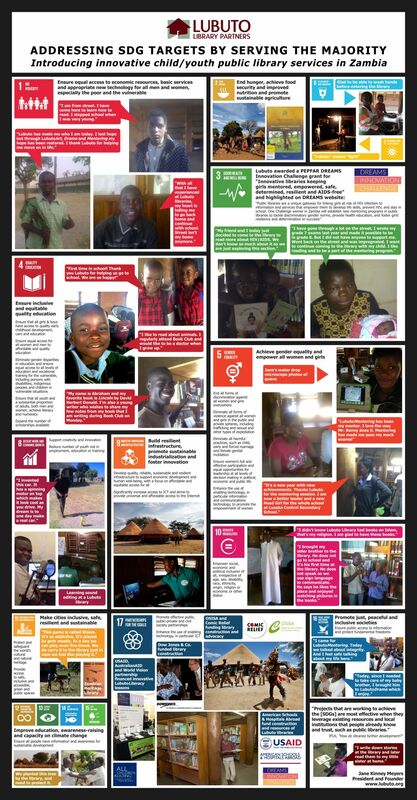 "Public Libraries as Drivers Towards Agenda 2030: a case study of Lubuto Library Partners"
Meyers, Jane Kinney (2016) Addressing SDGs and library relevance by serving the majority [of the population of children and youth]: introducing innovative child/youth public library services in Zambia. Paper presented at: IFLA WLIC 2016 – Columbus, OH – Connections. Collaboration. Community in Session 101 - Poster Sessions. "Enlightenment to Lubuto's children through reading and culture"